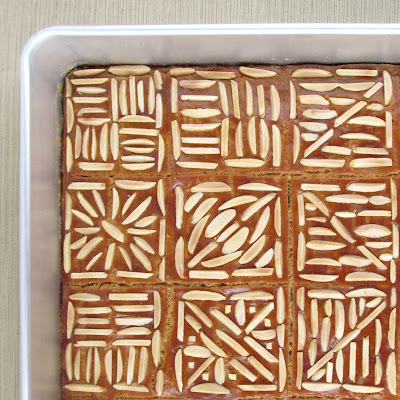 Francijn of Koken in de Brouwerij was our January 2013 Daring Bakers hostess and she challenged us to make the traditional Dutch pastry, Gevulde Speculaas, from scratch! That includes making our own spice mix, almond paste and dough. Delicious! This month, we created a Dutch pastry that I had never heard of, using a fresh ground "speculaas" spice blend made of 9 different spices. 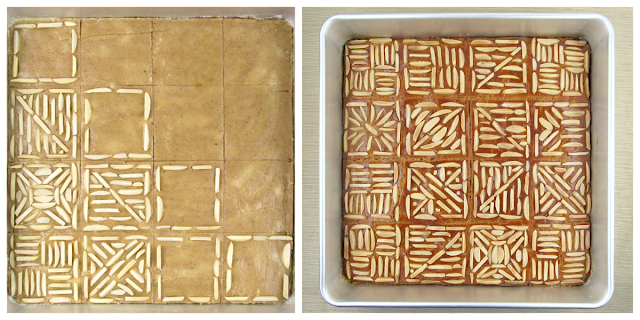 The top and bottom layer are the spiced dough, which is similar to gingerbread, and the middle layer is an almond paste that is flavored with lemon zest. Very fragrant and delicious. The smells coming out of the kitchen while this pastry bakes are intoxicating! 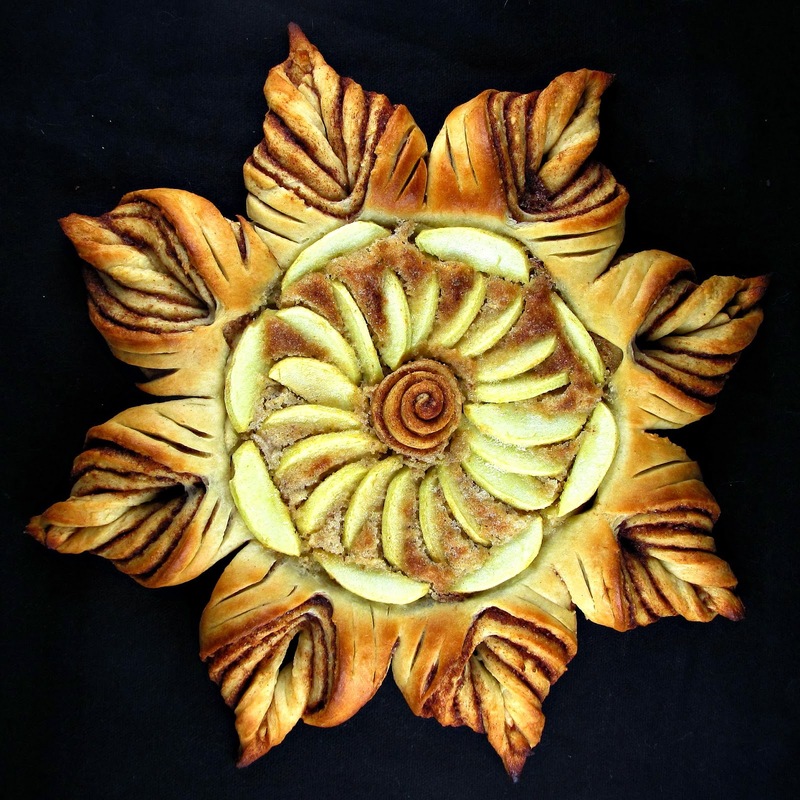 When I read in the Daring Challenge post that we were to follow Francijn's given recipe and decorate the pastry as we pleased, I knew just what I wanted to do. I have always enjoyed creating quilt-like patterns out of cut paper and found objects, but I've never used edible objects before. The idea was to create 16 unique squares so each was its own work of art. 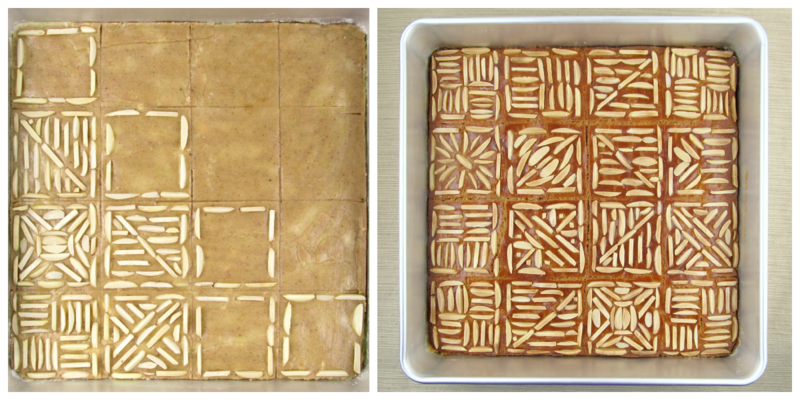 Just as I hoped, the cut squares look really pretty on a plate! 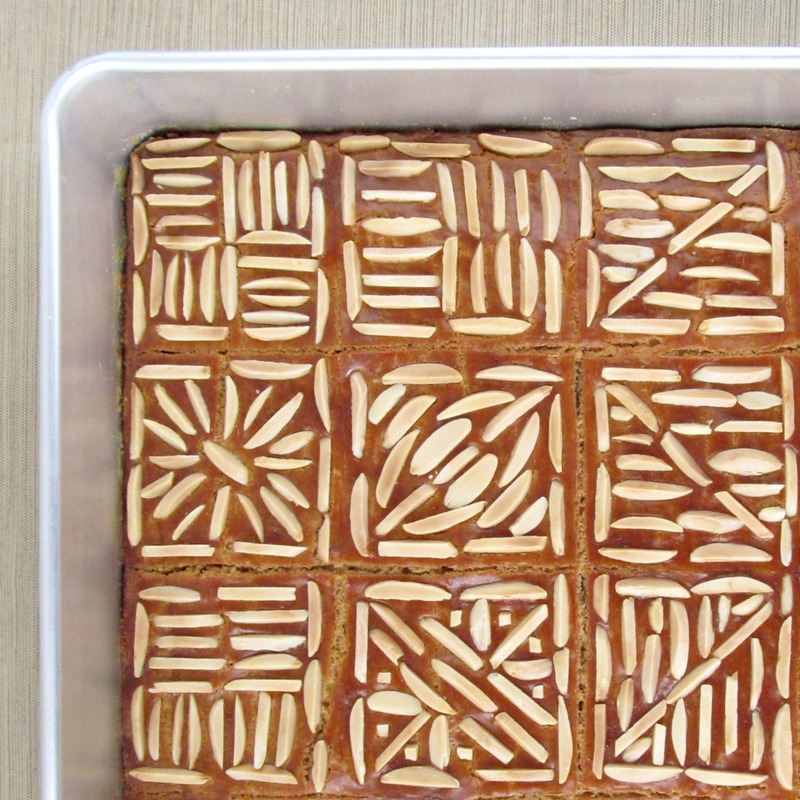 Creating the patterns in the squares was fairly easy to do, though admittedly I had to place each slivered almond using tweezers and it took me a while. I made each pattern up as I went along. If I did this again, I would likely plan a pattern and repeat squares throughout - maybe 4 of each design - so it wasn't so random and unbalanced. This time, I went for whimsy, which is a little more free and fun to do. Adapted from Francijn's original DB recipe found here. Any of these spices that can be purchased dried yet whole, such as peppercorns, clove and cardamom, use whole and estimate the measurement to equal 1/4 teaspoon when ground (extreme precision is not crucial). Place all dried spices together in a clean coffee or spice grinder and process until the spices are mixed into a fine powder. Store airtight as you would other spices and use as you would cinnamon, allspice or pie spice. Grind together almond flour and sugar for one minute in a food processor. Add the egg and lemon zest and process until combined. It will get very thick. You may also mix in the egg by hand. 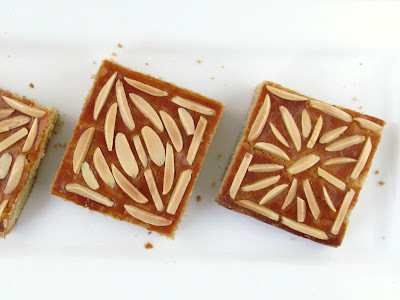 Store the almond paste in an airtight container in the refrigerator for up to 2 days before baking your Gevulde Speculaas. Whisk together flour, baking powder, brown sugar, salt and spices in a bowl. Dice your butter and toss it into the dry mix. Using a pastry cutter, your fingers or a fork, cut the butter into the dry mix until the butter pieces are smaller than peas. Using your hands, knead the dough together in the bowl until it is cohesive and smooth. Moisten the dough with a splash of milk if necessary for it to come together. Form your dough into a round ball. Wrap the ball of dough in plastic and chill in the refrigerator for two hours or up to 2 days. Grease your pan and preheat the oven to 350F. Divide the dough into two equal portions. 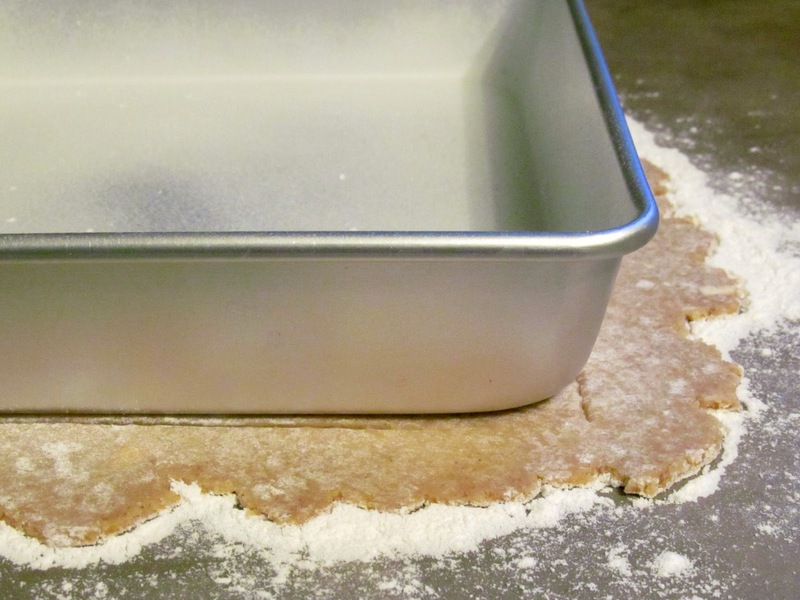 Roll out both portions, one at a time, on a well floured surface until they are exactly as big as the baking pan (or roll out and cut to size). Put one of the layers in the pan and press it lightly to fill the bottom. Brush 1/3 of the egg over the dough in the pan. Roll out the almond paste between two sheets of parchment paper, until it is exactly as big as your dough, and put it on the dough in the pan. If the paste is too soft and sticky, you may spread the paste using your hands instead of rolling it. Press the paste lightly out to fit in the pan, and brush the next 1/3 of the egg over it. Place the second layer of dough on top of the paste, press it lightly, and make it as smooth as possible. Spread the last 1/3 of the egg over the dough. Decorate the pastry with the almonds, as desired. Bake for 40 minutes in a preheated oven. Let cool completely in the pan before cutting and serving. As a quilter, I love your decorations! As a baker, I am impressed with your patience! So beautiful. That is an amazingly impressive looking dessert! I mean, the dessert itself looks delicious, but the time and care you put into the decoration - that is truly awesome. It looks beautiful! Very well done. How incredibly beautiful this is. I am late on the challenge this month, but I am inspired to finish it. This is just soooo pretty! You had to spent a huge time with it. Great work! Beautiful speculaas! I've never seen this technique with the speculaas dough before. I love what you did with the almonds! Just gorgeous! Wow Hannah, I can't stop looking at your gorgeous speculaas - well done!! Seriously, my jaw dropped when I saw your pictures on the forum. Thanks for the inspiration! this is undoubtedly the best looking speculaas, amazing effort on the decoration, if you look at mine it may seem silly, and before this i thought i did a decent job with the decoration :) , but what fun was this challenge .. loved it. Oooh you really are patient! Very elegant! wahou!!! j'adore ton travail tellement raffiné et élégant!! bravo et merci pour ce plaisir visuel!! 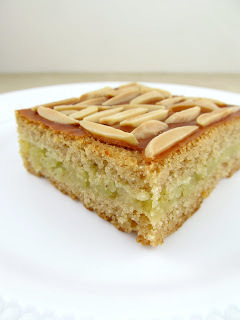 i love your beautiful designs with the almonds, and the smells sound wonderful! Spectacular. Such attention to detail. Loved the way you decorated each square! You did a wonderful job on this challenge! Your decorations are truly breath taking. I remember seeing them on the forum and thinking...now that's creativity! Beautiful! Such a wonderful idea. Now I really wish I'd would have made time for this challenge.